Faced with the end of the first Star Wars Trilogy, and in need of a new concept around which to base their Star Wars action toys, Kenner's designers invented a future for the Star Wars universe that went beyond both the Return of the Jedi film and their Power of the Force product line. The concept revolved around a new villain, Atha Prime, who had harnessed the power of cloning technology and built an army of evil Clone Warriors. These bad guys did battle, of course, with a much-matured group of fomer Rebels, Luke having grown into a full-fledged Jedi Knight, and Han donning the flashy outfit of a heroic leader. Finally, both sides were outfitted with vehicles, the assortment of which would have surely grown as the story line was expanded and the concept developed. From a look at this conceptual work, the extent to which the creative people at Kenner understood Star Wars--indeed, the extent to which they were a part of Star Wars--is abundantly evident. The designs tie into the look as well as the mythology of George Lucas' universe, and achieve a wonderful balance between the requirements of a toy and the need to somehow live up to the innovative design standards set by the films. This work is also significant in that it represents the first post-ROTJ Star Wars scenario, developed some five years prior to the bulk of what has been printed in various comics, novels, and roll-play scenarios. Before Grand Admiral Thrawn or Prince Xizor were ever dreamt of, the first original rouge villain and technological terror were created here, by a toy company. Kenner, by this time, understood the Star Wars license to such a degree that, years later, Lucasfilm's licensees are still mining the same territory. 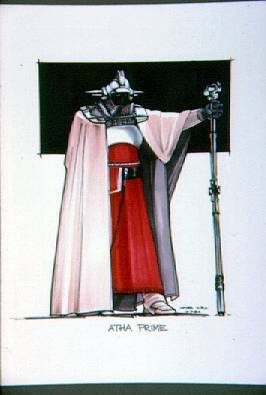 Here we have Atha Prime, the main baddie of this new Kenner universe, who would have zoomed around the galaxy in his personal ship, the Apex Invader. His design is taken almost without change from an early Lucasfilm concept painting by Nilo Rodis-Jamero for the Emperor's Royal Guard (see The Art of Return of the Jedi for a reproduction of this rendering). The design was actually recycled by Dark Horse Comics for their 1993 Dark Empire series, and was eventually made into an Expanded Universe Imperial Sentinel Kenner action figure in 1998. Over a decade after the proposal of the character, Atha Prime--or a version of him, at any rate--made it onto toy store shelves around the world. Much of the information regarding this unproduced material was first brought to light by collecting guru, Steve Sansweet, who covered these concepts and prototypes in issue #2 of Star Wars Galaxy Magazine.